World famous angel specialist Doreen Virtue asked her angels for career guidance the first time when she was feeling lost in her 20s. This was before she had regularly started to communicate with them and wasn’t familiar with the response she might get. But the answer she got from her divine helpers was clear: “Go to college.” But with two young boys to take care of, she didn’t see it as a possibility at all. So she asked the angels what else she could do. “Go to college!” she heard again. The angels were firm. She also received a clear vision of herself standing on a stage talking to a lot of people and being interviewed on TV. But she thought “Heck no, not me! Who am I to do that, and what would I talk about?” But the angels don’t listen to our inner dramas, and step by step Virtue got guided to finish college, and now years later she holds a Ph. 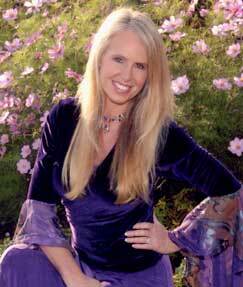 D in Counseling Psychology, is a best-selling author and travels around the world giving inspiring lectures. We might not always see where the angels are taking us to start with, but their intentions for us are always the highest possible when we are lovingly being guided by these divine beings. Tall, with blond long hair like a true California babe and dressed in a long velvet shimmery dress, Virtue asks the audience at the I can do it conference in San Diego to close their eyes. “Now imagine how it would really feel in your body to be completely protected and taken care of at all times.“ This is how our angels want us to feel in every moment. We have angels whose sole purpose it is to take care of us in our everyday life! And there is no problem too big or too insignificant for them to attend. Ask about anything. Our angelic helpers can help unite us with our soul mate, find our life purpose or clear up energies within relationships. They have all the time in the world for us, since angels live in the dimension where time doesn’t exist. What do the angels want from us in return? Only that we ask for help, and believe the answer that we are given! It can be given to us as a vision, as a song on the radio or just a strong feeling of wanting to change something. And if you get the same answer repeatedly, then you can be sure that it’s the angels talking to you! When we ask the angels for help, we shouldn’t outline how we want our manifestation. Leave that to God. We should simply ask for what we desire and add – this or something better. Sometimes it is our Ego who wants that great job or house, but it might not always be for our highest good. The angels see the bigger picture and that’s why it is good to add the latter words. Virtue says that she used to think that if she surrendered her life to God, that she would end up living in a small wooden shack, with no more glittery shoes and living off food stamps!” But- God has higher standards for us than we do,” she affirms. It is just a matter of releasing our control issues and dare to go with the divine flow. The angels are asking us to stop worrying now! It’s a toxic energy that keeps us in a strait jacket and it clips the wings off the light workers. Virtue says that it is our responsibility to the world to not worry. What we focus on gets bigger. We always have a choice when it comes to our problems; A, worry about it or B, pray about it. If you see a feather, it could be a sign that our celestial helpers are close. People are also sent to us by the angels in needed situations. They help us, and before we know it, they are gone. And don’t be surprised if they are called Michael or another angelic name! Virtue made the audience promise not to run over our intuition with logic. “If the sky is clear when you are about to leave your house in the morning and your intuition tells you to bring your umbrella, then take it. The Ego is going to tell you not to take it because there aren’t any clouds.” This is logical override and it can complicate our lives more than necessary; and it could be in more serious situations than ending up in a rainstorm without an umbrella! It could be ending up getting married to the wrong person or buying the wrong house. So when the alarm bells are ringing in your mind- trust them and act upon them!